“…Babies love the cushy, coziness of of our Eco-Buds™ Take-Along Pals. Earth Friendly, parent approved. These portable little playmates attach to strollers, carriers, high chairs and more quickly and easily. No Hassle. No Fuss. All of our Eco-Buds™ Take-Along Pals are made using organic cotton fabric, inside & out. Delightfully entrancing colors are achieved using only low-impact dyes with absolutely no heavy metals. Soothing sounds engage babies and hold their attention. These little companions are hypoallergenic, non-toxic and phthalate-free…” Discover more about one of the adorable Eco-Buds Take-Along Pals sets in Miss Frugal Mommy's review! Now for the exciting part! 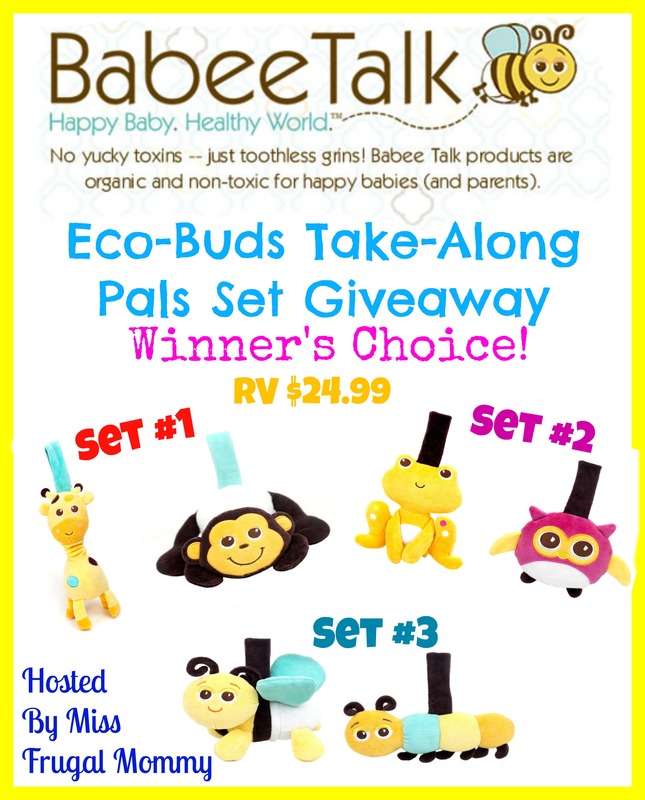 One lucky fan is going to win a Eco-Buds Take-Along Pals set of their choice (RV $24.99.) This giveaway is open to US residents 18 and older. Enter to win in the rafflecopter below, all entries will be verified, one entrant per household or you will immediately be disqualified. Winner will be contacted via email and has 48 hours to respond before a new winner is chosen. Good Luck!! !